In May 2017 Greater Manchester elected its first metro mayor, Andy Burnham for Labour. He will have control over the whole Greater Manchester combined authority area and will work with existing city leaders to take forward their strategic plan. You can find out more about the new metro mayors on our FAQ page. This page brings together the key facts about the city-region’s economy and what local residents see as the top priorities for the new metro mayor. Greater Manchester consists of the following local authorities: Bolton, Bury, Manchester, Oldham, Rochdale, Salford, Stockport, Tameside, Trafford and Wigan. Understanding how the city-region performs on key areas like productivity and employment helps the new metro mayor to assess what they should prioritise. The table below shows how Greater Manchester compares to the UK average on these indicators. Source: All data publicly available. For full data source details contact Centre for Cities. Averages displayed are either UK or GB average depending on the data available. By commiting to the plan, the metro mayor can also build consensus and trust with local authority leaders. To implement this effectively, the metro mayor should evaluate the outcomes and manage extensions and improvements accordingly. What powers does the Greater Manchester metro mayor have? 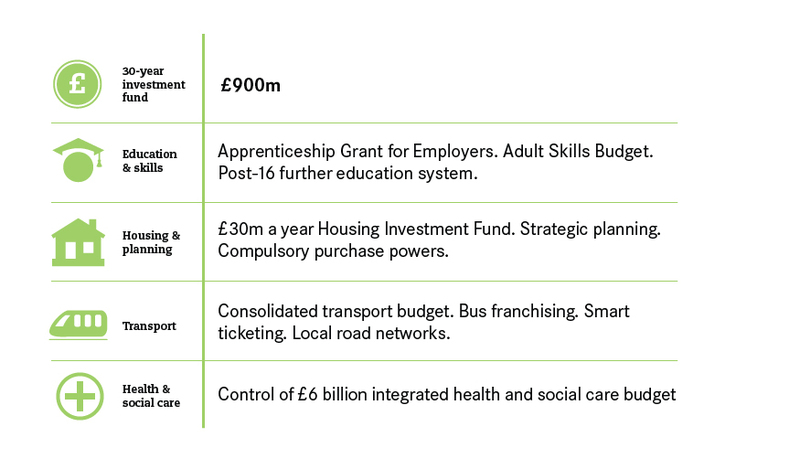 Below is a summary of the powers the new Greater Manchester metro mayor has. The metro mayor has control over an integrated health and social care budget for the area, unlike the London mayor, who does not. What is the political landscape in Greater Manchester? Labour’s Andy Burnham is the current metro mayor, he won with 63.4% of the votes. Second was the Conservative Sean Anstee with 22.7% of the votes. The turnout was 29%.